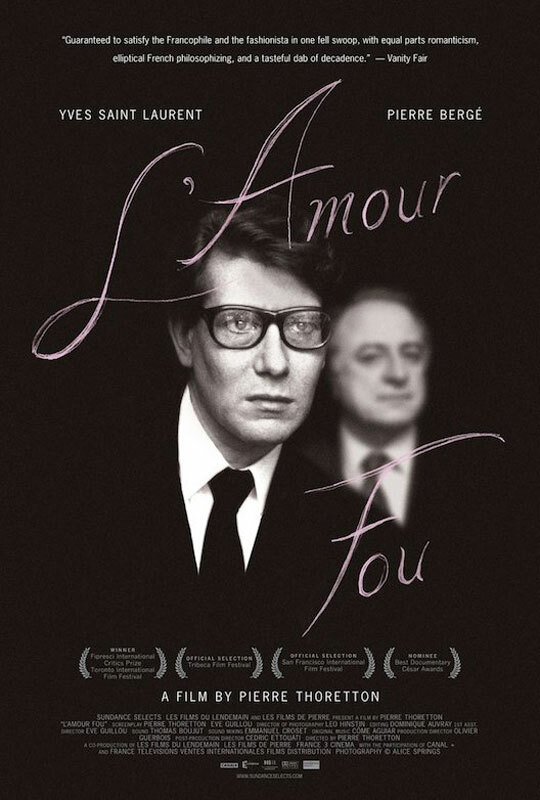 The late fashion designer Yves Saint Laurent and industrialist Pierre Bergé were romantically involved for 28 years, and continued to be close friends and business partners for another 22. During that time, they acquired a staggering amount of world class art. As Laurent says in an archival interview, “Every man needs aesthetic ghosts in order to live.” Now that Laurent is gone, the ghosts he surrounded himself with serve no further purpose for Pierre. He is preparing to auction off the collection, with the proceeds going to an AIDS charity. L'AMOUR FOU wants to be a biography of Yves Saint Laurent as told by Pierre, the man who knew him best. But for whatever reason, Pierre comes across as guarded and distant, never giving us much beyond a basic sketch of his lifelong friend and lover's life. Surely there must have been passion between the two at some time, but we never feel it, and even the most important passages in Laurent's life get glossed over. The art collection whose sale provides a framework for the film is given an equally superficial treatment as director Pierre Thoretton's camera glides past these museum quality works with barely a glance. There's also some attempt to show Laurent's own work in the context of being an art form itself, but aside from yet another quote from the late designer, the film never really states its case. Although a handful of others who knew Laurent give brief interviews, they barely register. For 90 percent of the movie, the voice we hear is Pierre's, which makes for a somewhat one dimensional portrait. Having more points of view would have been helpful, although according to Pierre, Laurent wasn't much for getting together with friends. Maybe Pierre really was the only one who knew him well enough to have anything of substance to say, I don't know. Whatever the case, the film we have here is dry, passionless, and far more lightweight than one would expect from a film about such a major figure of the 20th century. 2 out of 4 stars.